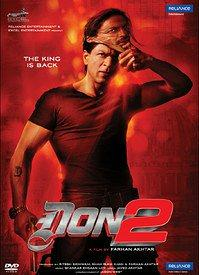 Don 2 is a sequel to the 2006 film, which itself was a remake of the 1978 Amitabh film. The plot in this film picks up 5 years after the earlier Don ended. SRK wants to dominate the European underworld, to set his plan in to motion he must seek the assistance of his arch enemy Vardhan ( Boman Irani), but Vardhan is in prison. So SRK gets himself arrested and lands up in jail to get him out and set his plan in motion. The plan: steal the money printing plates of the German Central Bank. Buy DON 2 SHAHRUKH KHAN (Bollywood Hindi DVD)with english subtitles, sold & shipped by JSM MUSIC where you can shop online for Hindi Movie DVDs & Bollywood Music Audio CD & MP3, Discounted Indian DVD. This Amitabh Bachchan Film collection has been tagged as Srk Film, Action Film, Hindi Movie Dvd.